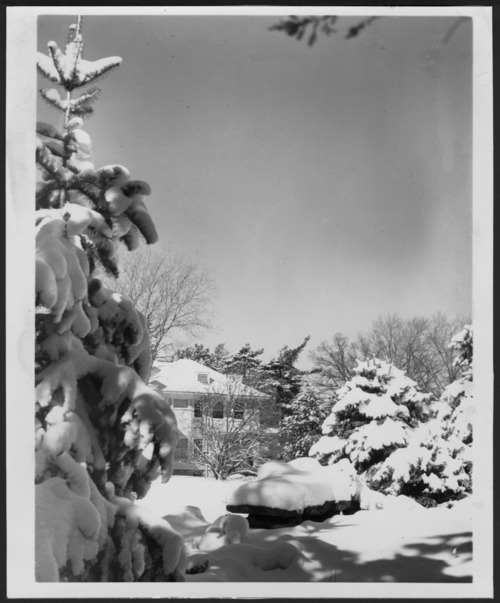 This black and white photograph shows the first Menninger Clinic in Topeka, Kansas, as it appeared in 1952 after a snow storm. The Menninger Clinic was established in 1925 with the purchase of a farm house and admittance of 12 patients. The philosophy was that mental illness could be treated with an integrated medical, psychodynamic, and developmental approach for the total health of patients. The building was located on West Sixth Street.